I’m so excited to share a new adventure with you! I took my first trip alone this week and it started out rocky, but I truly had the best time ever and am so happy I followed through with it! I was supposed to be with Austin over spring break in Spokane to watch his baseball games, but they got moved to Utah because of weather. So, I looked up hotels and did some research on where to go in Florida and decided to drive there! It’s my last college spring break and my birthday week, so I wanted to make it memorable. It was a 12 hour drive… Definitely the longest I’ve gone alone but it saved me a lot of money from buying a plane ticket and then having to pay for Ubers when I got there. When I was leaving my house I had a moment of panic because I felt sad going alone and not spending my birthday with the people I love, but I’m honestly so happy I went and got to experience something new. My friend MacKenzie and I were meeting up the day of my birthday and she lives in Jacksonville. We actually met over Instagram but this was our first time meeting each other in person! I was originally driving to Tampa because I wanted to go to Clearwater Beach, but halfway through the drive my mom called me and asked why the heck I was driving an extra 3 hours when I could just stay in Jacksonville for the week (thank god for moms they’re so logical). So my dad who is a magical trip god got on the phone with the hotel I was staying at and moved everything around so I could stay in Jacksonville! The first night I got there was interesting since the hotel got switched so last minute…. the hotel was something else to say the least. I had the biggest meltdown when I got there just so tired from the drive and having all the plans changed. I’m also an uneasy person when I don’t know the plan or where I am, especially when alone. I passed out and then the next morning got a great hotel and had the BEST day with Mackenzie! We got brunch, content for our blogs, went to the yummiest beach bar, and walked around the beach! She was the best host taking me around to the coolest spots in Jacksonville and we had much needed girls time. I can’t wait to have her come visit me in Kentucky soon! Before I moved to Kentucky I had all my best friends in one place and it was perfect, but when you move away and know nobody it can be extremely hard to make friends who you love like the ones back home. I’ve met 3 people now on Instagram who have become some of my best friends and I think social media can be so positive in that aspect! 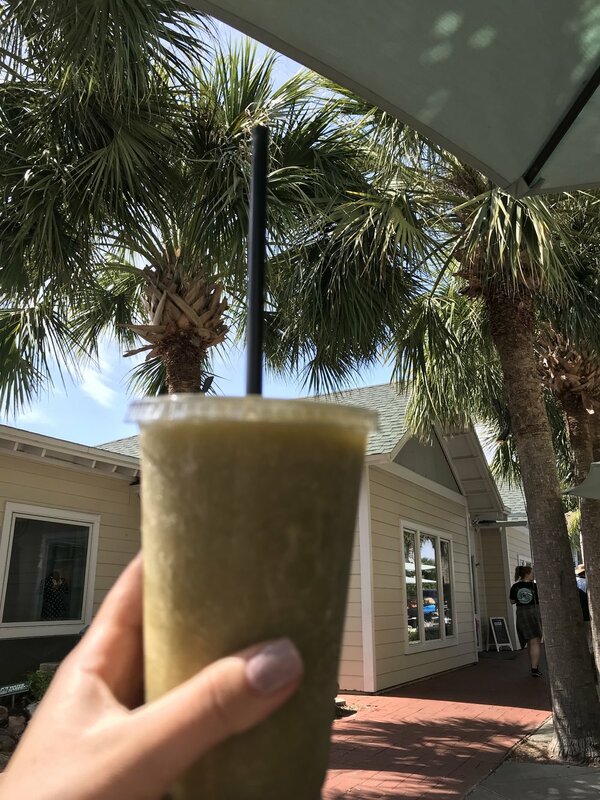 On Thursday I went to the cutest coffee shop on Neptune Beach called Southern Roots and had a green kefir smoothie while sitting under the palm trees. On my way there I was driving through a pretty town center with fancy buildings and restaurants along the water. Before turning into the center the road names were almond, cherry, & lemon! SO CUTE!! After enjoying my smoothie I went to lay out at the beach and got sizzled by the sun. That night I went back to my hotel room and got wings for take out and watched Austin’s game. That’s a perfect night to me so I was so happy to wake up the next morning and do the same thing over again! 30 Day Celery Juice Challenge - Success!